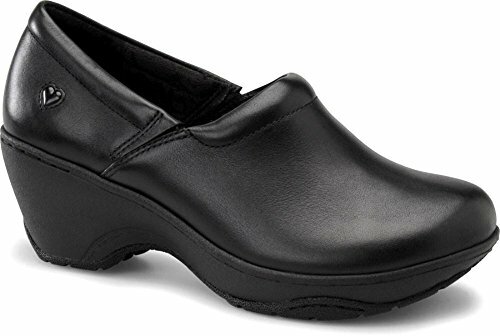 Cushion your feet in sleek, professional style with the Nurse Mates Women's Bryar Slip-On Clog Shoe. The luxurious Pillow Top footbed molds to the shape of your foot as you walk, providing all-day cushioning and comfort. A lightweight polyurethane outsole absorbs shocks and resists slips to keep you steady on your feet, and side elastic inserts deliver a secure fit and easy on / off. Pillow Top footbed conforms to your foot and provides long-lasting, comfortable cushioning. Lightweight polyurethane outsole delivers superior shock absorption and slip resistance. Side elastic inserts provide you with a comfortable fit and easy on / off. Blown EVA midsole, composite shank, polyurethane outsole. Heel Height: 1 3/4 inches.